You can’t deny the health benefits of doing yoga on both the mind and the body. So why wouldn’t you want your kids to be able to participate too? For the younger kids, you might be worried about their short attention span or their inability to do anything slow and calm. Worry no more! Here are some easy yoga poses to do with your younger children, and it’s a routine that should only last about 10 minutes. Unless of course you decide to stretch out the length of time you hold each pose. That’s completely up to your discretion and your understanding of your own child’s attention span. Start off by holding each pose for 30 seconds each, with an equal break of time in between each pose. If they show more of an interest as they get the hang of it, you can extend the hold time to one minute each. The most well-known and possibly the most basic of the yoga poses, Downward Facing Dog has many benefits and is a great pose to start off with for young children. It stretches the backs of the legs, and strengthens the shoulders, arms and wrists. Plus, what kid doesn’t like being upside down? Positioning: Place your hands and feet shoulder-width apart. Imagine making a triangle with your body. Be sure you remember to relax your neck, or you might end up with some stiff muscles. An excellent pose for stretching the back, this is another easy and quite relaxing pose. Your kids might also enjoy pretending to be the animals these poses are modeled after. Positioning: Start out on your hands and knees, then breathe out, arch your back up like a cat, and hold. After holding that pose for 30 seconds, reverse the pose–breathe in as you lift your head up and stick your belly out towards the floor. 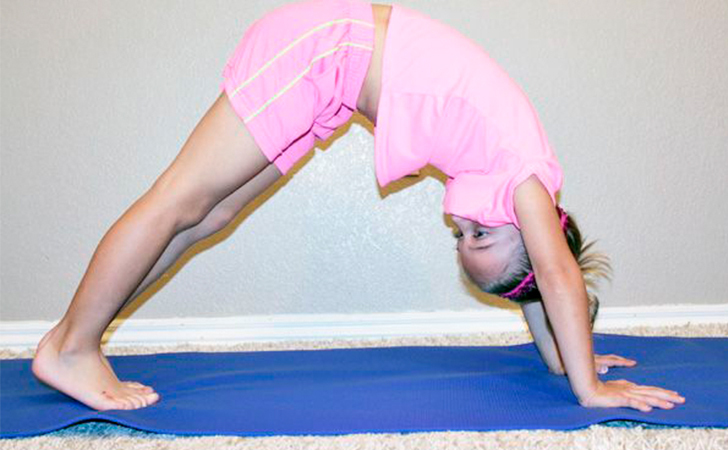 Click over to the next page to see more yoga poses perfect for kids! Previous ArticleDo You Know What Foods You Are Eating That Are Covered In Pesticides? Yoga Is Keeping This 87-Year-Old Young And It Can Do The Same For You! Could You Be Spreading Major Germs When Blowing Out Your Birthday Candles?